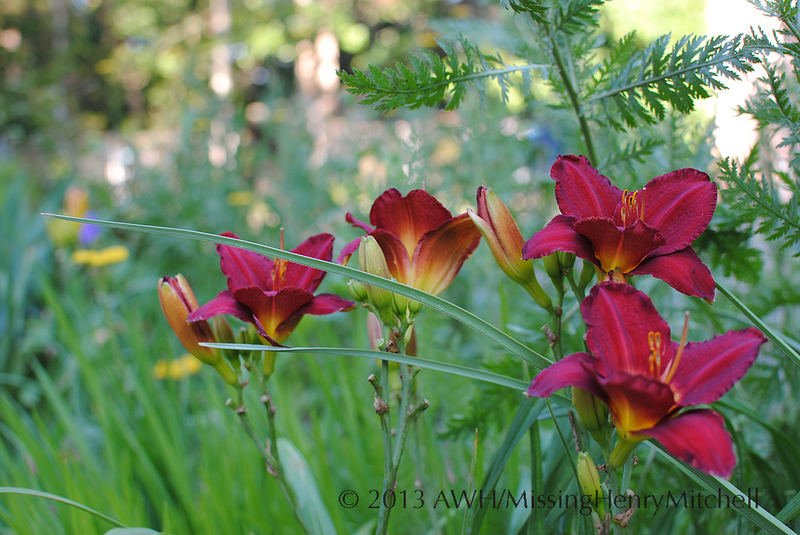 I have been meaning for some time to make a small catalogue of my daylilies. An unknown, tall yellow variety. This one is a muddier, mustardy color. 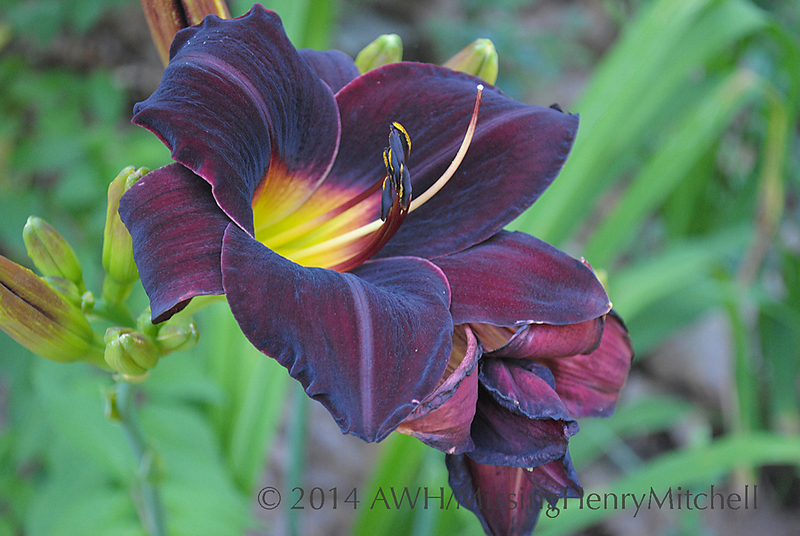 Hemerocallis ‘Total Eclipse’ is a dark violet, almost black. 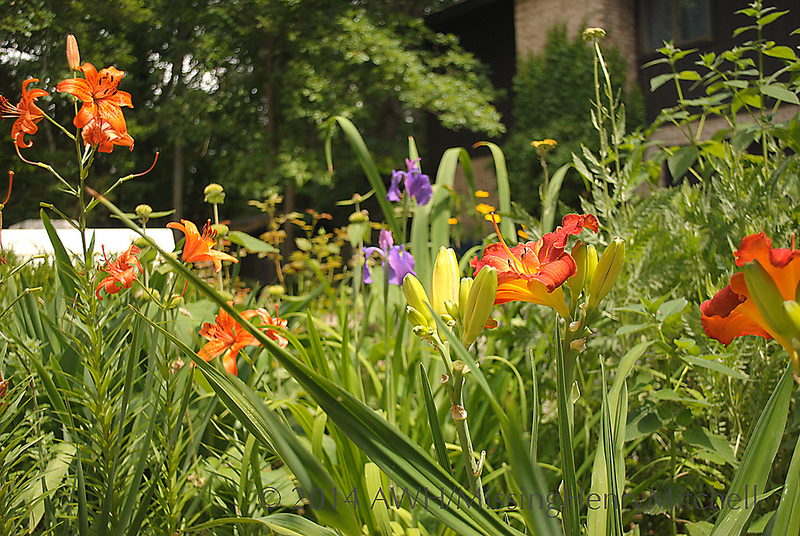 Hemerocallis ‘Little Business’ is a very short variety, growing about 12 inches tall. I cannot find the name of this one. I just got a set of extension tubes for my camera. I went out to play with them for a short while today. 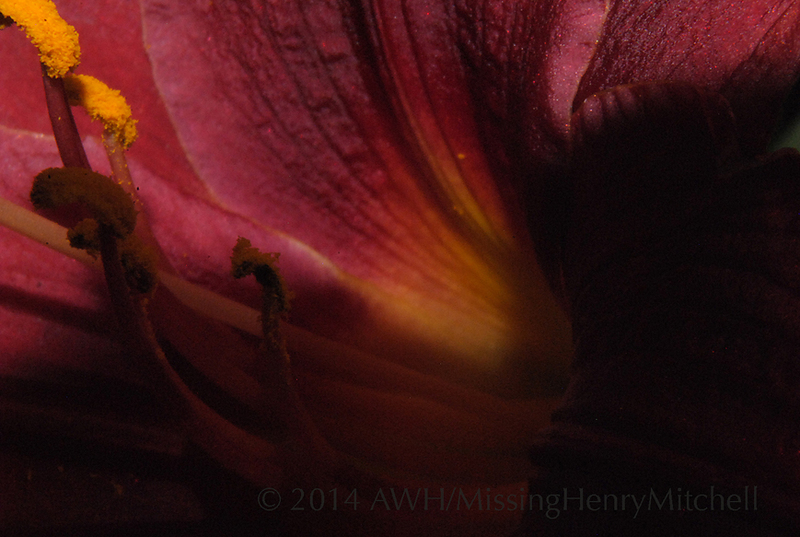 I need to practice (and I need a rail for the camera), but I love how the texture of the petals just pops. Carol at May Dreams Gardens hosts Garden Bloggers’ Bloom Day on the 15th of each month. I’m a little bit behind. 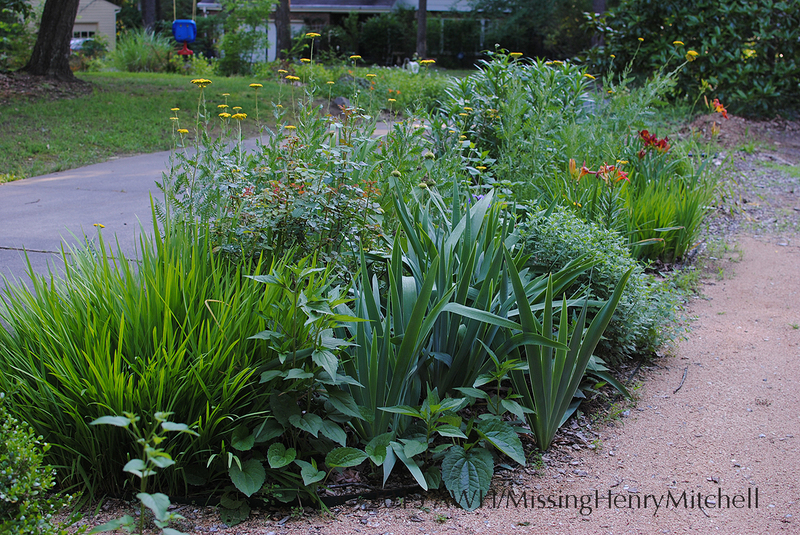 It’s starting to get hot, but the yarrow, daylilies, helianthus, and salvias shrug it off. In a shadier section of the garden, Hemerocallis ‘Chicago Royal’ has found an attractive companion in rose campion, Lychnis coronaria. Hemerocallis ‘Chicago Royal’ and rose campion (Lychnis coronaria). 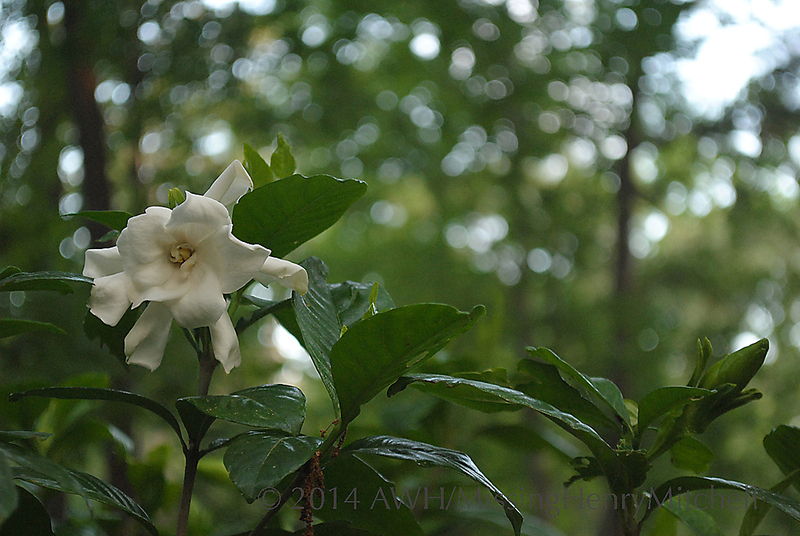 Fat gardenia buds unfurl overnight and release their rich perfume during the day. And the deer visit. 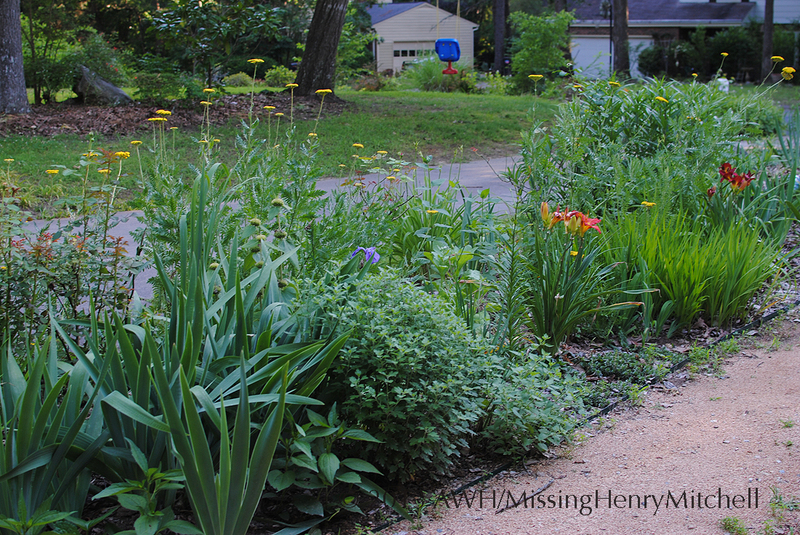 The area of the garden just beyond the gardenia hedge has been decimated: daylilies, lilacs, and hostas have been nibbled to sad little stalks. I need to spray the deer repellant, but it’s rained at night lately. I need to find a solution to make it stick for a week or so. Any suggestions? Another busy work week, with little time spent in the garden. I knew that I had a busy week ahead when I stopped by Big Bloomers Flower Farm on my way home from a trip last weekend. That did not stop me from buying 3 cardboard flats full of perennials, plus a few annuals that were on sale. I have planted exactly one flat’s worth. That’s okay, because nothing has died yet and I think this weekend I’ll make good progress on a new garden bed I’m starting. No name for it yet, but it will run along my neighbor’s fence, between the fence and the back of the rain garden. In my mind it looks fantastic. The crinums are blooming, probably because of all the rain. I don’t remember them ever blooming this early. I cut back the rose campion to keep it from dropping seed everywhere–I have enough of it–and planted nicotiana and portulaca from Big Bloomers.The Monarda I acquired from a gardening friend earlier this year has bloomed, and instead of red, it’s wine-colored. It’s beautiful, but because of its color, it’s in the wrong place. I think it will look excellent in the blue slope, though, so that’s where I’m moving it. And in the process, I found some lily bulbs that haven’t ever done anything. I dug those up and am potting them, little scale chips and all, into a flat to see if I can propagate them. 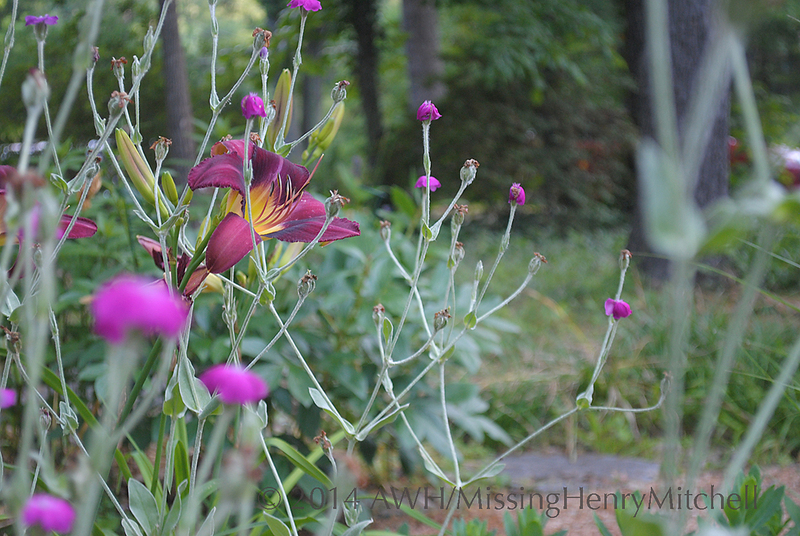 Hemerocallis ‘Chicago Royal’ and ‘Ferris Wheel’ have recovered from the deer visit a week ago. I haven’t been able to apply the Plantskydd, though, because it needs 24 hours to be rainproof and we haven’t had a guarantee of 24 hours without rain since the visit. I’m too stingy with the stuff to risk it. All things in time, I suppose. Deer: They always find us. I had a good run of things, but last night, the deer found me. 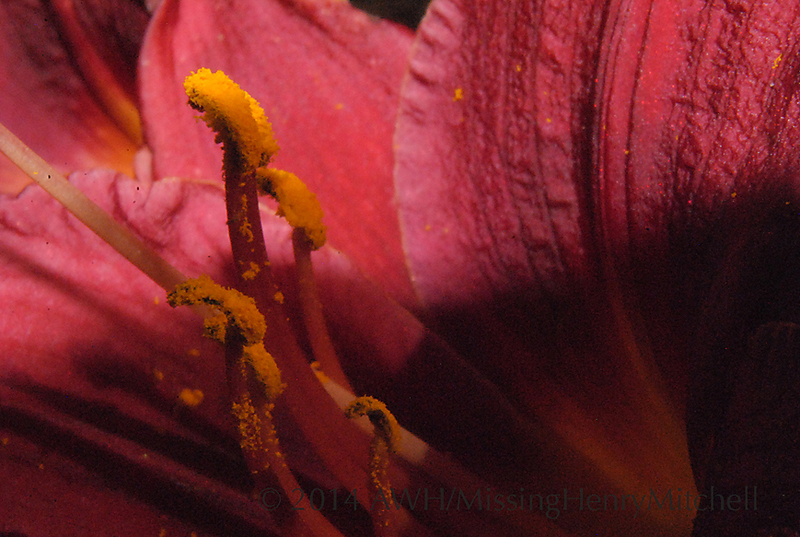 I walked out this morning to find all the lovely, fat buds on my daylilies munched halfway down, leaving sad, wet little stubs. They also did an effective pruning job on one of my roses. I do have some Plantskydd in the shed, so I guess it’s time to break it out and see if it works as promised. It had better; it cost enough. The hot border looks as good this week as it ever has. Daylilies ‘Grand Opera,’ ‘Prince Redbird,’ and ‘Ferris Wheel’ are all in bloom, as is the unidentified yellow one I got as a pass-along. Tall golden yarrow and purple Iris sibirica ‘Caesar’s Brother’ lend balance in both form and color. I noticed as I cruised the garden this morning, coffee in hand, that I have inadvertently selected daylilies that all have yellow throats. I have at least 10 separate varieties with yellow throats. At least, I suppose, I am consistent. Busted a little bit of non-sod over the weekend in the white garden. Transplanted Shasta daisies from a very crowded container, as well as some seedlings of white cleome and a Penstemon species from my winter sowing adventure. 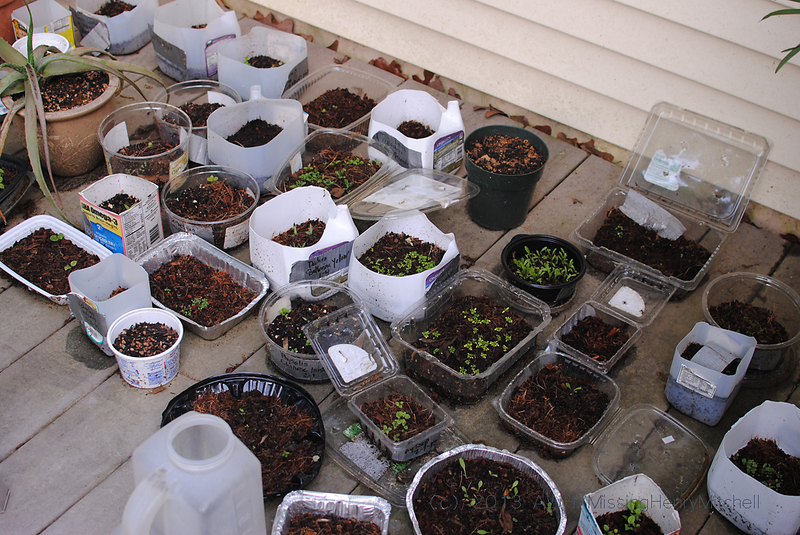 Only 31 containers of seedlings left to plant. I knew this would happen, but I did it anyway. High 83, absurdly heavy rain in early evening.